The steep descent of the oil price isn’t all bad for the big integrated oil companies. Strong results from refining and marketing limited the fall in profit at both BP and Total in 2015’s first quarter. With the price of a barrel of Brent crude down 50 percent from the previous year, these gains are welcome. But they may not be sustained. The British company reported underlying first-quarter profit of $2.6 billion, about double analysts’ expected $1.3 billion. That was a relatively modest 20 percent decline from the previous year. Even adjusting for a one-off tax credit, Barclays estimates net income was still 31 percent above consensus. Refining did better than expected at BP. Input costs – crude oil – fell more than the price of petrol and other products. At French Total, adjusted net income from refining and chemicals more than tripled from the first quarter last year to $1.1 billion. The fillip may be relatively short-lived. Even though Europe’s oil giants, including BP, have downsized their refining units in recent years, Total expects structural overcapacity to weigh on profit margins in the medium term. Lower oil prices may eventually restrict supply, but BP and Total are boosting production: Total by an impressive 10 percent. However, the low oil price is hurting cashflow. After the most generous adjustment for working capital and Gulf of Mexico spill payments, BP’s operating cashflow was about $5 billion, less than the $6 billion disbursed on capital expenditure and dividends. The ratio of net debt to total capital crept up to 18.4 percent, nearing the company’s self-imposed 20 percent target. To sustain dividends, it is imperative to keep spending under control. Investors believe that both BP and Total are on the right track. Their shares have risen around 17 percent this year – better than peers. Speculation that BP could be a takeover target, despite British political resistance, may have helped the shares. However, the market is not getting carried away. Morgan Stanley estimates BP’s 2015 dividend yield at a generous 5.5 percent. Total’s is 5.1 percent. That seems about right for companies which remain in urgent need of self-help. 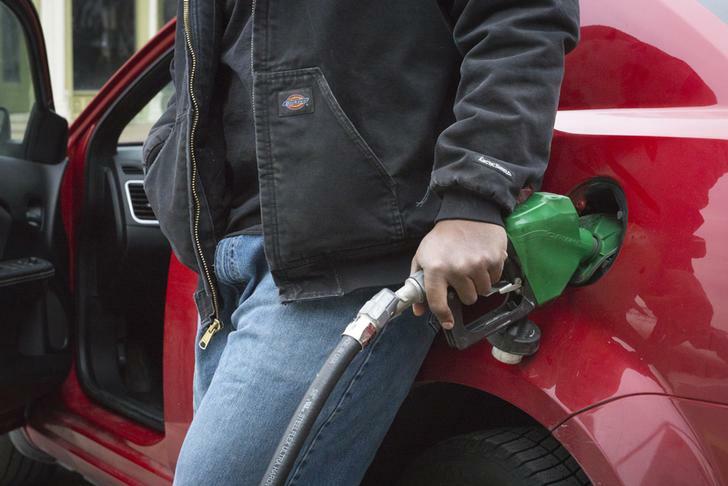 A man gets gasoline at a BP station in St. Louis, Missouri January 14, 2015. BP reported on April 28 a headline $2.1 billion replacement cost profit in the first quarter, against $3.5 billion in the same period a year earlier, on the back of lower oil prices. Excluding non-operating items, the London-listed oil and gas major posted a 20 percent drop in first-quarter underlying replacement cost profit to $2.6 billion. This was double analyst expectations of $1.3 billion thanks to stronger refining earnings and a one-off tax credit. Underlying pretax replacement cost profit in the downstream business was $2.2 billion for the quarter, compared with $1 billion in the same quarter of 2014. For the first quarter, total operating cashflow was $1.9 billion, compared to $8.2 billion in the same period a year earlier. Organic capex was $4.4 billion, compared with $5.4 billion in the same period of 2014. Gearing was 18.4 percent at the end of March, up from 16.2 percent from the previous quarter and within its target ratio of between 10 percent and 20 percent. The UK major said it had agreed $7.1 billion of sales of its announced $10 billion asset disposal programme. Meanwhile France’s Total saw adjusted net income fall 22 percent in the first quarter to $2.6 billion, also beating analyst expectations. Production increased 10 percent in the quarter thanks to new projects. Adjusted net income from refining and chemicals more than tripled from the first quarter to $1.1 billion. BP shares were up 1.4 percent to 483.4 pence by 1050 GMT, while Total’s were up 1.8 percent to 50.1 euros a share.